Stoner was first published in 1965 with respectable reviews and reasonable success. Fifty years later it became a bestseller almost entirely by word-of-mouth among readers and was re-issued by Vintage. I came across this book as it was one of the Readings staff recommendations. 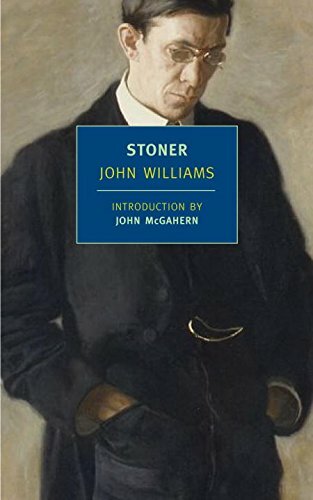 Stoner follows the undistinguished life and career of William Stoner a lifelong academic, who entered the University of Missouri as a student in 1910 and went on to teach there until his death in 1956. The book observes his career and workplace politics, his marriage to Edith, his affair with his colleague Katherine and his love and pursuit of literature to deal with his unfulfilling home life. The first quarter of the book was a little slow but you connected with the characters and by the end I felt it was a terrific and terrifically sad little book. Depicting a life not entirely lived. I became emotionally drawn to Stoner, he is a character impossible to forget.